This article and video series reviews how beach volleyball players who develop a “Game Plan Offense” can takes advantage of “Learned Automatic Response” and “Implicit Guidance” to beat opponents and overcome physical disadvantages on the court. The tactic I will discuss were used quite successfully in the 2016 Olympics to defeat Kerri Walsh Jennings and April Ross. This Olympic win is testament in my opinion on how smaller less athletic teams can follow similar tactics to beat taller, stronger and more athletic teams. I see this becoming the standard for beach volleyball coaching in the near future. Importantly similar tactics can also be used for indoor volleyball and these tactics are already being taught at out Volleyball1on1 camps and clinics. In war if you are fighting a stronger opponent you will never attack them head on. Rather you will choose your battle field and attack where they are weakest, not ready, and need to react to your attack vs. being prepared for the attack. Yet in beach volleyball most teams on offense do not consider this and attack their opponent in a straight line where the opponent is waiting and prepared. Just like war the team on offense can often choose and control the battle field or attack location. If the serve receive offense team controls the pass they control the offense and where they attack along the net. The first point of attack I am going to review in this post and the area I think the most effective when in system is the middle middle location with a back set. For this example I will review this from the ideal of right-handed players playing left side and left-handed players playing right side. Important notes related to and understanding our Volleyball1on1 Coaching Language and Culture can be found below. Terms like “middle middle” and “white set” are explained as well as points related to the OODA Loop. The “White” set is a back set, where the passer passes forward, in front of their inside leg and runs an attack on a back set, through the middle middle location. This attack along the net and set offers many advantages in our opinion over a regular up and down set outside front or outside middle. The defense is attacked where they are weaker or even weakest. As the defenders move, they become easier to read and “orientate” in the OODA Loop. Because the defenders are easier to “orientate,” implicit guidance” or “learned auto response” can be developed with training resulting in players moving through the OODA Loop faster or essentially only having to OOA, essentially illuminating the decision process. Because the defense is moving they suffer from “response complexity” which reduces their defense effectivity. Because the defense is moving they are less effective at reading as their heads are not still and only focused on the task of reading. Because the defenders are just trying to move into the correct position they are less likely and successfully able to run defensive plays like a 3 block 4 block. Because the defending blocker is moving to start, they are less effective at blocking line to middle as they cannot adjust as effectively to the set location or what they read the attacker doing. Blockers will tend to only block line or only block angle. Because the blocker is moving this will often create more opportunities to successfully attack on two or even just set the ball over the net on two. It is surprising how many kills will happen in women’s volleyball where the attacker runs a back set and the setter just sets the ball forward for a kill on two. This increased threat of a second ball attack further increases “Hick’s law,” and “response complexity for the defense” thereby slowing their ability to move through the OODA Loop. The momentum of the set tends to lead to the ball being more often in front of the players hitting shoulder. 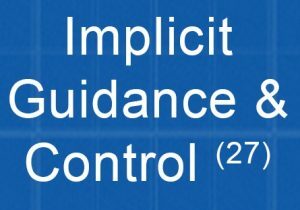 Implicit Guidance and Control – Learned Auto Response. Once the team on offense creates “known relatively controllable stimuli,” this creates and opportunity for them to control their offense and set up a situation for “learned automatic response” on offense. On a white set learned automatic response becomes a pretty easy due the ability to quickly and easily “Orientate” the opponents defense. Not only do our eyes pic up movement more successfully, we are able to process that movement more successfully than stationary objects with our peripheral vision. This is because peripheral vision pics up movement more successfully than stationary objects. Line chip shot over the block. Hard cross body hit back into the line in the form of a hard hit. Sharp cross body hit into the line short in the form of a cut shot. In the case where the defense blocks angle, this leads to allot of problems for the defense. If short line is very easy to see and hit if the blocker goes angle. The cutback short and deep angle are also both very easy to hit on a angle block either around or over the block. I have included some videos of this in action. Branden timing is too early and he gives it away to early at the moment. We are working on this and I will try post more videos as he gets better at it! Play 2 – Hard line hit with the blocker blocking ball. Notice how easy it is to hit line unless the blocker commits to the line block because of how the set carries to the hitters hitting shoulder. Play 4 – Easy cut shot when the blocker is line and the defender is middle. The ball traveling across the body onto the shoulder makes the cross-body cut shot very easy to hit. Play 5 – Another hard line hit with the blocker blocking ball. Notice again how easy it is to hit line unless the blocker commits to the line because of how the set carries to the hitters hitting shoulder. This is how the Brazilian’s could sideout so effectively on Kerri and April in the 2016 Olympics. In review, setting up your offense and attacking where your opponent is weakest, not ready, and need to react to your attack vs. being prepared for the attack offers many advantages over attacking in a straight line. I believe as this is practiced and executed more this will become the norm and a new age of beach volleyball offense will be introduced. If you are a beach club program or a high level professional team or an international team looking to add this to your program contact me here! Indoor Volleyball Applications: The information I shared in this article can be applied successfully to indoor volleyball. This past season we had a number of high schools and clubs use this information and run new “Game Plan Offenses” based upon it. I will do my best to post some new content related to this in the next few weeks. We divide the net into 5 locations on offense – Outside Front, Middle Front, Middle Middle, Middle Back, Outside Back. This is the same for both players and relative to the player. The most effective locations to attack from on a good pass is: Middle Middle, Outside Front and finally Outside Back in that order in our opinion and based upon the science we have seen. When I refer to a 2 set it is higher than a regular 2 set indoor. It can be 4-10 feet above the net. Most important is the location and that the ball is set in more of an up and down trajectory.